Constance Jost was a well-known South Jersey artist whose works incorporated fish and other marine creatures. A resident of Port Elizabeth, Cumberland County for 15 years prior to her demise on January 9, 1998, Connie was a 1969 graduate of Vineland High School, a 1973 graduate of Montclair State College, and an apprentice with Jersey City artist Patsy Novell. She received her master’s degree in fine arts from Goddard University in Los Angeles. Connie taught in several schools throughout the New Jersey Bayshore area, and was always enthusiastic, humorous, imaginative, and an inspiration to her students. 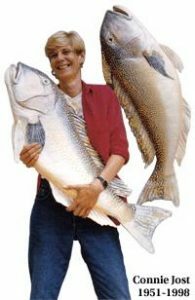 Connie was a sculptor and a painter who used molds of fish and other marine life found in southern New Jersey to create latex replicas that she then painted as accurately as possible. These replicas were incorporated into sculptures and relief paintings. Widely displayed, and appearing in exhibits at the Rosenfeld’s and Muse galleries in Philadelphia, Connie’s works were often described as whimsical and comical. The titles frequently involved puns: Flukes of Nature, Infant Tile, or Migraine Haddock. Many times the message was more political or environmental. Stars in Snipes depicted the American flag as a net of abundance, while at the same time challenging the viewer to question the practice of over-fishing and the resulting depletion of a vital resource. Ms. Jost’s works on public display include the relief paintings Airloom for an Ocean Floor in the Cape May County Court House and Another Salmon Chanted Evening in the headquarters of the Montana Fish, Wildlife & Parks in Kalispell, Montana. In 1993, the State of New Jersey purchased Shellife for display in the Marine Studies Center of Rutgers University in New Brunswick. The 20-by-13-foot fiberglass sculpture addresses the ecological concerns created by the human destruction of the ecosystems along the continental shelf. Connie’s untimely death was caused by cancer, the environmental illness of our time. Ironically, her life’s work depicted her concern for degraded ocean habitat and her death served as a sentinel of the degraded nature of our own habitat. Connie was an innovative teacher with boundless energy who donated time to the Bayshore Discovery Project and other endeavors which she viewed as making a contribution to the marine environment. The Schooner Project regularly consulted with Connie for her innovative ideas, and they have provided us with a list of miscellaneous activities that Connie submitted to them. These activities were typical of her ability to go beyond the confines of conventional thought that restrict many people’s creativity. Connie had a talent for tapping into kids’ natural curiosity. The sketchy nature of the list, which is in the form of rough notes, forces the reader to become more imaginative in interpreting what Connie may have intended. Teachers may be able to build a lesson plan around any of these activities. We hope that by implementing these activities Connie’s teaching spirit may live on, just as her artistic spirit survives in her work. Historically, early sailing, fishing, etc. were recorded by drawings. They were often farfetched. Years before it was faddish, I found a book on NAUTICAL KNOTTING. We learned it, the kids loved it, and it turned out to be the basics of MACRAMÉ. Sailors made key rings and bracelets. Most were real boating knots. Any chance of making something to PEOPLE scale like an oyster… and trying to open it the way a starfish does? SCRIMSHAW: What do sailors do without TV? Give out plaster tiles… engrave with pencil-like implementation… wax, then shoe polish engraving. Don’t know if it would work… but something similar might. I was surprised to learn a friend goes everywhere in the world from his backyard on the Tuckahoe River. Chart a way to anyplace using the rivers as highways. We’ve forgotten how to look at it that way. EXOTIC AQUATICS is the term used for all things that now live in the waters that are not indigenous to the area. Phragmites, certain worms carried on boats, zebra mussels, oyster diseases. Products inspired or made from local sea creatures: e.g. Barnacles inspired super glue. Make up more. ARTWORK AND CRAFTS: made from sea creatures, local and historical: jewelry, mother-of-pearl, driftwood. Make something. Tumble some oyster pieces? Could some kind of “Where’s Waldo” mural of the Bay be made? Or a collage that each student could add to?